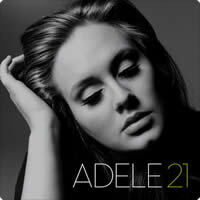 Rolling In The Deep was written by Adele Atkins & Paul Epworth. The song was recorded in 2010 and released on Nov 29, 2010 from her album 21. 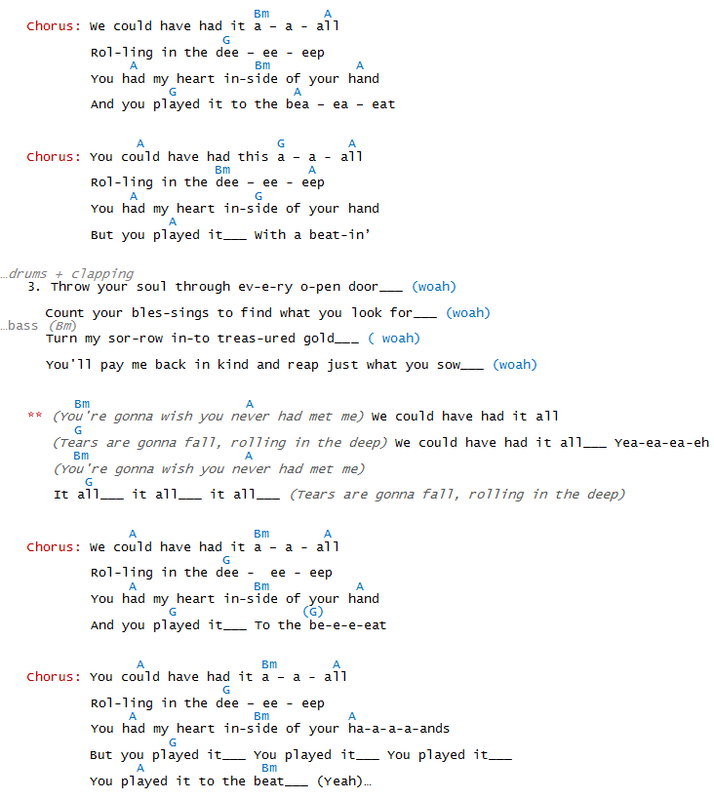 The song can be played using all power chords since the strumming pattern is all down-beat. This means all the chords are 5th chords or 5 chords, which means you play the tonic and 5th interval of the each chord omitting the 3rd interval. The chord formula is 1 - 5 (2-note power chord), or 1-5-1 (3-note power chord). You can do this by simply playing all the chords as barre chords and hitting the bottom 3 strings on each down-stroke. You may want to play the Bm with the barre on the 7th fret using an Em shape. All the other chords are E-shape chords, although technically speaking, since you're playing power chords and only hitting the bottom 3 strings, you can play all the power chords using the Em shape... very easy. Instead of Bm - F# - G - A, the chords would read, B5 - F#5 - G5 - A5. Remember that power chords are neither major or minor due to the omission of the 3rd. This means you can play power chords over major and minor chords and they will sound fine. The down-stroke pattern is 1& 2& 3& 4& - each down stroke is muted with the palm of your hand. You can hear this on the video. I have used 'normal chords' on the song chart just in case you want to play it differently, and for beginners who may find the above a little confusing. The eighth-note/quaver rest in front of chords in each verse means that you play the chord just behind the beat by an eighth or quaver beat. If we count the time of every bar as 1 & 2 & 3 & 4 & , instead of strumming the chord on the first beat or 1, we strum the chord on the 2nd half of the first beat, which is on the & of 1&. If you listen carefully, you can hear this and also see it in action on the video. 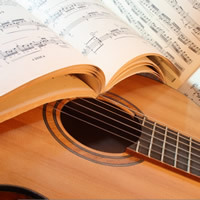 The squiggly line at the end of certain lines in the verses represents a glissando, which simply means glide or slide from one chord to the next. Here, we slide from the F# to the A while still playing down-strokes on each chord. Just listen and watch the guitarist on the video. The slide occurs from F# to A. You slide to the A on the & of the & 4 & beat of that particular bar. Again, listen and watch closely. If you are unsure of the song, try watching the video several times and whenever you catch a glimpse of the guitarist playing, watch and listen closely. If you are finding the information a little confusing, watch the video several times and every time you watch it, you will notice all the subtleties mentioned above. You can play the song any way you like and the most important thing is that you enjoy yourself. However, if you do want to play it like the musos in the band, you may want to revisit the above. Rolling In The Deep was Adele's first No. 1 hit in the US, reaching number 1 in 11 other countries. It was the first single released from the album 21 (digital release), and was motivated after Adele’s relationship with her boyfriend had ended. The song was the means for Adele’s well-deserved breakthrough to success in the USA and internationally. It went to number 1 in more than 10 countries and sold more than 7 million copies in the USA. The song was Adele’s first number 1 hit in the US and it stayed in that position for 7 weeks, remaining in the charts for more than twelve months. In 2012, Rolling In The Deep became the highest selling digital song by a female artist. The song was nominated for numerous awards including MTV Music Video Awards, Grammy Awards and Billboard Awards. The result - it won 3 MTV Awards, 3 Grammy Awards and Billboard Year End Top Hot 100 Single. Rolling In The Deep has been used in several TV series including Doctor Who, Gossip Girl, Glee and One Tree Hill. 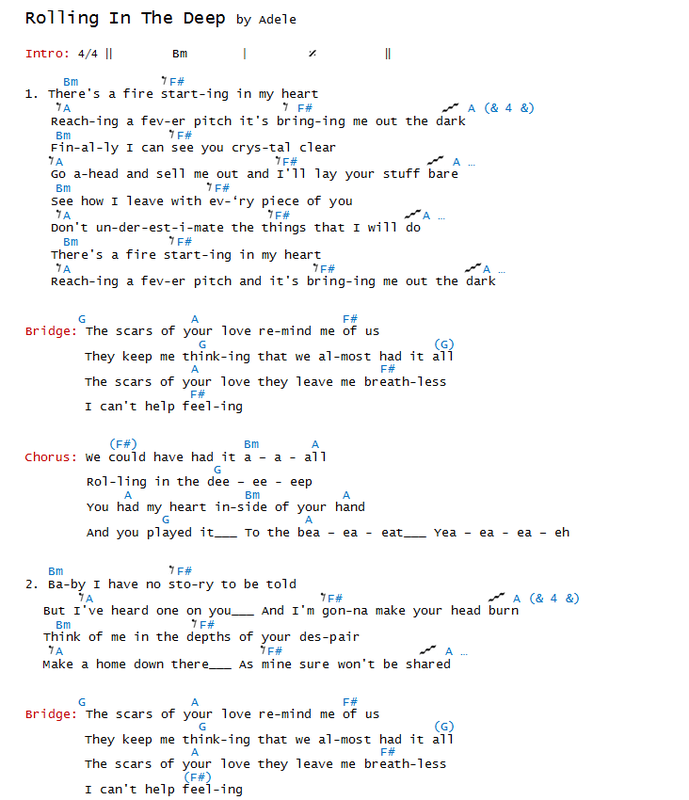 "Rolling In The Deep" chords and lyrics are provided for educational purposes and personal use only.